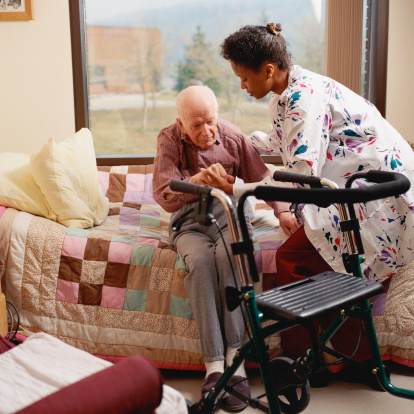 Being confined to long term care usually means that a senior is suffering from a serious chronic illness that prevents them from living independently and safely in the comfort of a private home. Long term care is what every senior hopes to avoid and yet most are destined to be admitted to such a facility. While it can be a comfort to families to know that long term care comes with round-the-clock medical staff and general supervision, there’s at least one risk that remains serious and threatening. According to a recent study published in the Canadian Medical Association Journal, almost 40% of residents experience head impact injuries due to falls. Falls have always been worrisome for seniors, but now these new statistics reveal just how frequently falling can lead to an extended hospital stay. 60% of those admitted for traumatic brain injury are due to falls and this number seems to be rising. For those 80 years or older, the risk is especially great. The research team behind the new report have conducted a study to determine why so many falls result in head injuries. They looked at video tape footage of 227 falls that happened to 133 residents in a long term care facility. About 37% of the residents who fell hit their heads. In 63% of the cases, the head impacted with the floor. The researchers noted that the flooring in the long term residences were hard tile or linoleum. Another 13% had head injuries from impacting a wall, while 16% had head injuries sustained from hitting a piece of furniture. The researchers said having 37% of falls leading directly to head impact injuries was an alarmingly high number. In young people, for example, falling rarely leads to head injuries. The researchers also discovered that the way a senior fell tended to determine whether or not he or she was likely to suffer trauma to the head. For those who fell forward, the risk was much greater. Backward falls didn’t seem to pose as high of a risk for head injury. Even though the researchers observed 74% of the seniors in the videos falling on their hands first, breaking the fall with the arms outstretched did little to stave off a head impact injury. This was likely the result of loss of muscle tone and insufficient strength in the upper body to slow the rate of acceleration to the floor, the researchers said. For this reason, the research team recommends that seniors perform strengthening exercises in their upper body. They also recommend that long term care facilities adopt safer environments for residents such as adding a soft sub-layer to flooring to cushion falls. While on the subject of falls, the National Center for Injury Prevention and Control is equally concerned about the number of older adults who suffer a hip fracture due to falling. The Center says that at least half of all older adults who are hospitalized for hip fracture never regain the same level of function they had before the fall. Like the previous study, they cite muscle weakness and functional limitations for triggering the kinds of falls that lead to fractures. The message seems clear: doing a little weight training now, before you reach your 80s could offer some serious protection for your bones and your head as you get older. “Seniors in long-term care residences: high risk of head injuries,” Medical News Today web site, Oct. 7, 2013; http://www.medicalnewstoday.com/releases/266965.php, last accessed Oct. 9, 2013. Stevens, J.A., et al., “Reducing falls and resulting hip fractures among older women,” MMWR Recomm Rep. March 31, 2000; 49(RR-2): 3-12.